I had a great experience with John this past week. John is pleasant, knowledgeable and thorough. He was patient when I was frustrated and helped me get over the learning curve to feel comfortable in the IFR environment. Aside from the IFR teaching, he also taught me about my airplane, making me more knowledgeable regarding airplane systems, maintenance and avionics. He seems to approach his work with the eagerness of someone who still enjoys going to work in the morning. After the first day or two, I found I was having more fun than I would have expected trying to get ready for the check ride. He had me doing engine out partial panel approaches before we were done, which was more than anything required on the check ride. 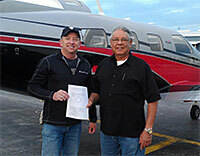 Then off to Idaho to find an examiner who was qualified to perform the exam in a Twin Commander. He and Pat met me at the airport when I returned to help me celebrate-a very professional gesture. I would be happy to work with John again or to recommend him without reservation. I recently completed my instrument training. Bill is a great instructor and was able to teach me methods of flying instrument approaches which simplified complex procedures. Upon completion of my training, I was able to confidently pass the oral and practical portions of the test. 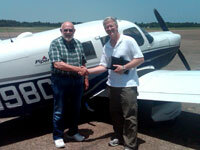 I plan on completing my commercial training with AFIT and Bill and have recommended AFIT to my fellow pilots. Thanks for your help and getting me scheduled with John, he is the best instructor I have ever had and he knows his craft. If he got me ready for my ticket he can get anybody ready, I wish I would have met him a long time ago. Anybody trying to get their ratings, AFIT’s the way to go…. Bill wasn’t just a good instructor during his time with me – he REMAINS a good instructor and friend AFTER his time with me and AFTER we have completed the mission of getting me my IFR rating. I say “we” because I could not have done the job without his insight and encouragement. I nailed each maneuver and the DE actually had a smile on his face when I landed – telling me to congratulate my instructor on the accomplishment. The FIRST person I called was Bill. To this day, I can call or email him with a question. I’m planning a flight tomorrow to my Martha’s Vineyard house. Forecast is for winds gusting 10-15 and low clouds with 40% chance of rain. I am confident in myself and the airplane that the flight will be uneventful – thanks to Bill and the philosophy of your company. Thank you very much. I am happy to have completed this process. It has been a long road but one I am glad to have traveled. It was a pleasure working with AFIT. The entire experience was positive. I enjoyed working through the details with you prior to “signing up”. Everything went off just as I was expecting. The training with John was terrific! 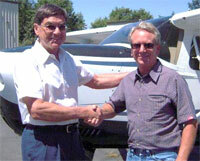 He is truly a gifted instructor and extremely knowledgeable in all aspects of general aviation. 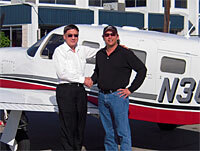 I have worked with at least ten instructors since I first got involved with general aviation in 1990. John is by far the best. I would recommend AFIT and John to anyone. I have had a little bit of time to “debrief” since finishing up my instrument training and I just wanted to take this time to say “Thank You” to you both! Tony, your course setup is, in my opinion, the best way to earn your instrument ticket. Whether you are a busy professional or someone with lots of time on your hands, how can you argue against getting your ticket in only 10 days? It is a proven system that many people have successfully completed. I am no different than anyone else and yet those 10 days of instrument flying were all it took for me. And honestly, I found that it came easier to me than my 14 day PPL last fall. In the last 7 months I have gone from not flying at all, to having my PPL, and now my instrument rating. I owe it all to AFIT and its accelerated flight training! John, your instruction is top notch! What else can I say. You have taken me from someone with only a dream of flying, to a VFR pilot, and now to an instrument pilot. The freedom of flying that I now possess, I owe it all to you. AFIT sets the curriculum for the advanced training, but when it really gets down to it, the INSTRUCTOR is who makes this whole thing a success. From the first day of our initial meeting for my PPL training I connected with your training style. Success with that initial meeting made me want to use you as my instructor for my instrument training. You did not let me down. I found that it came to me even easier than the PPL did. Something about the way that you mix it up, keeps it from becoming overwhelming. Of course, the regular joke kept the mood light for the 10 days as well. Through our experiences together I have gained even more than I had originally sought. Not only can I fly through the clouds, but now I have a lifelong friend as well. Just a short note to thank you for the fantastic, and fantastically effective, 14 day PPL program run by Eric out of St. George (UT). For starters, I cannot imagine many more qualified instructors than Eric. With a CFII and also an A&P there was little he couldn’t make comprehensible in a few short sentences. His airmanship is similarly outstanding. He could drop the Cherokee on a table cloth sized spot on the runway under any weather condition and demonstrate the PTS maneuvers with a precision that made me despair for a while that I would ever be able to meet the standards he set for me. Perhaps even more importantly, Eric also was incredibly dedicated to the objective of making me succeed. It didn’t matter how many hours he had to spend with me to get a maneuver right and how long a day it became for him; the only thing that mattered was that I was going to get it right and would master the material. I was deeply impressed by his commitment to my success (especially since I clearly wasn’t the most talented student he ever had to bring along). Perhaps as a result of Eric’s dedication – and my matching efforts – the actual checkride was rather anticlimactic and almost “easier” than I expected, the sign of good preparation. Finally I’d be remiss if I didn’t acknowledge Rhonda’s (Eric’s better half) contributions. From taking care of the paper work, to picking us up and dropping us off she was a ray of sunshine and encouragement in an intense 2 week program. Thanks Rhonda! Needless to say, I unhesitatingly recommend A.F.I.T. and Eric to anyone looking to do an accelerated program. I want to thank AFIT and Lou for successfully getting me through the IFR rating. After 25 years of VFR flying the idea that I can now fly and be fully integrated in the air traffic control system and can safely get in and out of the busiest airspaces is very assuring. The knowledge and piloting skills I gained I now feel are essential and they are a huge benefit to me as a pilot. Not only can I fly at times when I would have been grounded and waiting, I am now safer and more qualified to fly on fair weather days as well. Your program was thorough and challenging but Lou was able to continually find a balance between enough and too much and as a result was able to keep me progressing quickly. I would highly recommend AFIT and Lou to any aspiring pilot, or current pilot, that’s looking to quickly advance their skills. Thank you very much for the incredible effort you expended on my behalf. I appreciate your patience and professionalism. I am very aware of how much I have learned from you and am very appreciative. Best of luck on your future assignments. Now that I have finished my IFR training, I can say that I am extremely pleased to have chosen AFIT for my instrument rating. You assigned Hal to be my instructor for the 10 day course and it worked out great, I got to stay home and train, while Hal lived close by and was able to make a small commute. As for the training, Hal was great, he was easy to understand and patient with my progression. For the 10 days during the course Hal was always encouraging and enjoyed instructing. With Hal’s amount of flight time in more complex aircraft, I was concerned that he would have a hard time transitioning back into a C172, however, I was very pleased with his knowledge and instruction he provided in my aircraft. During the course, I was surprised to feel like I was learning at a reasonable pace and not being overwhelmed with information. Hal had a great sense for how much information to provide at just the right time. During the 10 days, Hal would debrief after each approach and after performing any required objective for the rating. Throughout the course I was pleased with the quality of training I was getting and knowledge Hal was able to pass along from his many years of flight experience. Hal’s experience is priceless, with 10,000 hours of PIC time, his ability to teach from his experiences and relate it to instrument training is awesome. Hal’s willingness to share from personal experiences results in an easy application of rules and regulations that could be hard to grasp. 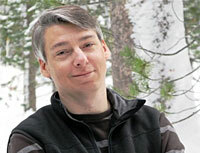 Hal’s strong desire to teach is a great combination with his knowledge and it showed throughout the course. I would gladly recommend AFIT as a resource to get an instrument rating or IFR refresher and would, without a doubt recommend Hal as an instructor for an instrument rating. Thanks again. The training approach was perfect for my busy schedule and Ralph is an “excellent” instructor. At first I was a little nervous that he was not going to push me hard enough, but about day 7 when I was getting cranky, tired and starting to make silly errors he was very patient with me and kept reassuring me that I could achieve my goal and I was on track. I enjoyed his stories (he has a lot of them) and he “fit in” well with our local airport crowd. Give him a bonus this year! I would not hesitate to recommend other pilots to contact AFIT. Thanks for all your help during this process. Bill was great! He was very understanding with my schedule and it was really helpful to split up my training between my home airport and Georgetown. He introduced me to so many new places to fly. Bill has a wealth of knowledge and it was great to get to work with him. I will definitely recommend AFIT and Bill to anyone I know who wants a great way to get their instrument training. I feel like I have so many more tools to use when flying, and it has made a more confident pilot. Thank you Bill for all the “tribal knowledge” and for the 5 P’s! The training experience was challenging and worked as promised. The concentrated consistency and intensity were the keys to success in my case, as I had been wanting my instrument rating for over a year but life kept getting in the way. Bill was “incredibly flexible” and calm with all of the challenges we encountered, including weather, mechanical and electrical issues, and we even finished a day early. Your customer service is unbeatable and greatly appreciated. 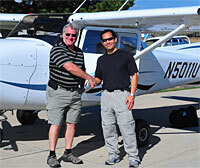 Thanks for your recommendation of John as my flight instructor. 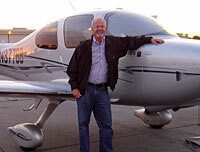 John had a wealth of knowledge to offer with his extensive aviation experience. 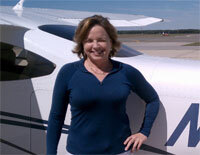 The main reason I chose “AFIT” for my flight education was the fast paced course you offer. There are many people who try to obtain their pilot’s license the traditional way but never progress to their check ride. In less than 2 months, I went from no knowledge of planes to a comfortable and confident VFR pilot. My training with John was 2 weeks as promised. The majority of the time John was training me; we had high to extreme winds. Learning to fly in these conditions was not easy but we flew each day, ultimately making me the kind of pilot I want to be. One who is capable of flying in windy conditions and making adjustments as needed from the experience gained during those 2 weeks with him. John continually reminded me, the importance of holding the centerline of the runway and not giving it up. This came in very valuable on one of my first flights after completing my training, when I landed on a runway with solid black ice, unexpectedly. Upon hitting the brakes, the plane started sliding to the side of the runway. Without John’s previous pressure to hold the centerline, I wouldn’t have recognized the situation as landing on ice. I would have thought that I just gave up the centerline, until it was too late, but I knew I was holding center and instantly realized it was icy, thus allowing me to make a safe and quick recovery. On my first cross country flight with John, he mentioned how much easier flying was than driving. At that time it seemed a little overwhelming but I quickly realized on my first, long, cross country trip, after getting my license, that he was indeed correct. It was much easier than driving and I felt calm and relaxed talking to ATC. John was well organized and didn’t waste any time. He was even teaching while we were eating lunch. His instruction was thorough and included some additional pointers that I feel will be valuable for my future flight career. I will definitely refer your services in the future and thanks again for recommending John. Thanks again. Your course is demanding, but with a good balance of flying and ground instruction, it was truly rewarding. Ralph was a “Great” instructor and teacher. More than just cover the practical test standards, he strives to really help you become an IFR pilot. I don’t think there was a single question I could come up with on any facet of IFR flying that he could not answer immediately and accurately and give a real life experience to explain really “Why”. I passed the check ride with no problems. This 10 day format was by far the best solution for me to obtain my IFR rating not to mention I made a new friend. Thanks for the “fantastic” training! I was a little skeptical at first, but Ed took a relatively inexperienced private pilot and turned me into a safe and competent instrument rated pilot is 10 exhausting but fun filled days. Ed’s demeanor and approach to flying are simply fantastic. I truly appreciated the experience of flying to places where I anticipate “real world” approaches in my everyday flying. I wanted to take a minute and share my impressions of the A.F.I.T. 10 day course and especially my instructor, Bill. If I had to sum up Bill in one word it would be patience. We began the course in Georgetown flying my Piper Archer II which I thought was in the best shape ever. After one day of flying the autopilot gave up followed by the number 2 navigation radio. I was really upset about the autopilot! Bill used his relationship with Central Texas Avionics to get the equipment back online the day before the check ride. In the interim we flew approach after approach in the gusty central Texas winds with Bills voice calmly goading me with the phrase, “okay now level the wings and you’ll fly right back into the donut”. One of the many phrases that was helpful to remember during the check ride although I still hear them in my sleep. We visited a number of airports around Texas with a variety of approaches and environments in differing conditions. The only constant was Bill’s patience and calm demeanor; oh and the aviation stories and his experiences weren’t bad either. We reviewed for the oral when we could and dined at some of the best small Texas town restaurants around. Bill in conjunction with AFIT was a great way, albeit intense at times for this gray haired guy to complete my instrument training successfully. Thank you very much and best regards to all. I find myself in constant amazement at the new level of competence and confidence I have since my IFR training, your methods and techniques have instilled a desire in me to continue to improve my skills and ratings. You should be truly proud of your work. Thank you. My Training with AFIT was the best dual instruction experience In the five years I’ve been flying. You guys were wonderful, you worked around my schedule and amazingly within just a week or two’s notice had everything taken care of, making getting my instrument rating during spring break a reality. My experiences with Ed was nothing short of awesome. He is a very enjoyable person to work with, and someone which you can really just sit and have a good conversation with. He really likes what he’s doing, and his previous experience as a teacher shines extremely well through his flight instruction. His knowledge and first hand experiences with Icing were extremely helpful, especially when we ran into some icing ourselves during the training. Ed was extremely knowledgeable, and made the training not only a great learning experience, but a fun one as well. While there was alot of information to absorb, alot of breaks enabled me to learn the information and then take some time to absorb what was learned. The days were long usually lasting from 8 to 6, but with the breaks they seemed to go by very fast. Throughout the training we logged quite a bit of time in actual conditions, taking us all the way from San Luis Obispo to the San Francisco Bay Area, and even a trip to Modesto,CA. The Oral Portion of the checkride focused on the basic systems of the Cirrus, placing emphasis on what you would do if you had an electrical failure. The majority of the oral was focused on the planned Cross Country which was from Salinas to Long Beach,CA. Questions were asked regarding the departure, approach, and enroute procedures for the planned flight with taking the weather especially the freezing level into consideration. The Oral also went over lost com procedures in detail and ended with going over various symbols on the Approach Plates and Low Alt. En Route Charts. Most of seemed to be more judgment style questions rather then A and B answer questions, which I felt very prepared for as Ed and I had gone over the weather and scenarios for every flight every morning for the last 10 days, including wondering why a Cessna 172 constantly flew into known icing almost every morning we checked the Pireps. AFIT would be my number one and only recommendation for anyone wanting to earn an instrument rating. I’m confident that when my Father takes his instrument training this summer that it will be with AFIT, and I’m positive that he’ll enjoy the training with AFIT just as I did. I would like to thank you for this great experience. Being a very low time private pilot the instrument rating seemed to be very far away for me but your fast, intense and “real life” method was the perfect choice as my business and family keep me very busy. You don’t have the time to forget what you just learned the previous day, you just keep improving it. Please say a very special thank you to John for me: despite having to deal with a very strong French accent and do many cross country trips in order for me to meet the requirements he has always been very patient and professional. He really took the time to explain the concepts and to improve my skills while both in the air and during ground school. But before all, I believe that what really puts him on top is his ability to always find the right words to preserve the balance between confidence and humility. I now feel much more competent and safer and I will not hesitate to recommend your program to any pilot. Hal was obviously an extremely well experienced instructor. He focused on teaching me what I asked to learn about and also added some new useful and valuable information on how to become a better instrument rated pilot. I would engage AFIT’s help again. I appreciate the help in earning my instrument rating. Although I had been working on the rating for over a year, flying every couple of weeks was not conducive to developing the knowledge or skill necessary to be a competent IFR pilot. 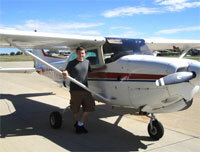 A.F.I.T.’s program of concentrated ground school and flying time fit my needs perfectly. Even more importantly, John my A.F.I.T. instructor, did a terrific job of ensuring the 10 day curriculum addressed the gaps and developed my flying capabilities. Pennsylvania has some very cold and windy weather! 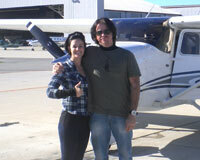 John is not only a competent, knowledgeable, experienced pilot, he is a “wonderful teacher” and genuinely nice guy! And obviously dedicated to my success! I was very well prepared for my oral and check ride and am now prepared to safely build my piloting experience and capabilities. I wholeheartedly endorse you’re A.F.I.T. training model and recommend John, without hesitation, to your future students. Hal is an “Awesome Instructor”. Thanks for everything and I will stay in touch. 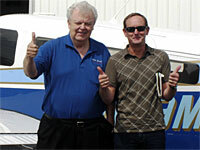 I completed my CFI and commercial ratings with your instructor Bill. I passed my check rides with ease! I found Bill to be a very competent CFI. Bill has a gift for instructing, even hard cases like this one, and a pleasant attitude which really helps during these hot temperatures in Phoenix! The examiner, Bill Toby, was the best I have flown with in my opinion, and set the stage for a relaxed ride to demonstrate my ability. What ever you’re paying Bill, it’s probably not enough! He really came through, and made a believer in AFIT, out of me. Thanks for all your help in making this happen. I just wanted to take a moment to thank you for an outstanding instrument training experience. I went into this with high expectations and was not’ disappointed. I can’t begin to say enough good things about Hal. He is a terrific instructor, mentor, and is an all around good guy. His knowledge of my aircraft and it’s systems was excellent and he was teaching me new things before we even started the engine! He was extremely flexible in working with my schedule, always available when I had a question, and worked his tail off to make sure I was ready for my check ride. I was thrilled with my experience with AFIT, and John. Not only did John do a fantastic job preparing me for my check ride he was also an invaluable resource as I became familiar with a new plane and a a new panel. As for the instrument check ride, I was totally prepared and it went very smoothly. I have already recommended AFIT to others and I will continue to do so. A successful training program has 3 key elements. 1. Instructor knowledge 2. Instructor fit/personality 3. Student commitment. I brought the commitment and Hal delivered his parts. Over the years, I have flown with a number of different instructors and none of them were as good at transferring so much information in a condensed period of time. Hal took me from a 4 four year break in flying vacuum gage aircraft to proficiency in a G-1000 equipped aircraft in 10 days. That is phenomenal. John was great. He’s a high energy instructor and kept me engaged. He never stopped instructing for a moment (I had to make it mandatory to stop for lunch because he’s like the Energizer Bunny). I’m so happy to have finished up becoming an instrument pilot in such a short time. A.F.I.T. is the way to go to minimize the hassles of scheduling instruction. John cared very much about my success and I feel like I’ve made a new friend. This was an excellent way to finish up my 23 year journey to get my rating. I’ve been out and about catching up with business from my time off and putting my knew rating to good use. Since my check ride, I’ve logged nearly 50 hours flying here, there and everywhere. Thanks again, and I look forward to scheduling my commercial instruction soon. I cannot thank you, AFIT and John enough for all of your time, expertise and professional guidance these last nine days. Your program, the follow-up, and the actual training were all well designed and individually tailored to get me to my ultimate goal of earning my instrument rating and license in less than ten days. As you promised, John was the perfect instructor to help me to achieve my goals. I had a lot of territory that needed to be covered, both for the oral as well as for the flying and John patiently brought me up to speed in both areas. John did a phenomenal job of getting me to my goal and objective of achieving my instrument rating in the time frame we had allotted. Tony, this was a monumental undertaking for me and I was very happy with the process, the professionalism and the outcome. 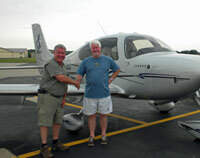 My thanks again to you and to John for taking me to a whole new level of flying! I would highly recommend AFIT and John to anyone who wants to devote ten concentrated days to this endeavor. Starting on Sunday morning with a full tank of fuel and a few hours of instrument training we began. I believed the approaches I had already flown had me ready and this was just a polish the rough edges. I quickly saw I had a lot to learn. A couple of days later I had quite frankly given up. Now a word about my instructor. Ralph did not give up. In fact, in my darkest hour he said “I have not given up on you”. He gave me a confidence and a determination to do what needed to be done. 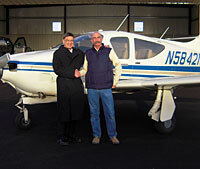 His patient counsel and clear instruction coupled with his knowledge of the airplane made it possible. Ralph would break it up with a story or an actual newspaper article about his flying career. Soon I was ready to do it again. On the fourth day I shot all the approaches perfectly and he said your ready. We set up the check ride for Thursday and I passed. It was tough but the sense of accomplishment was incredible. Ralph was always there and met me after the ride. I cant thank him enough in helping me achieve a goal I have had since childhood. Ralph, Thanks again. My flight experience with AFIT was just how I had imagined it would be. With my instructor, being very knowledgeable and easy to work with, I quickly gained the aeronautical and ground knowledge required not only to pass, but also to excel on the oral and flight test with no problems. John and I started by identifying what I had the most trouble with and over the course of the time with him we were able to correct the problems that likely was created by other instructors who themselves passed on their bad habits to me. 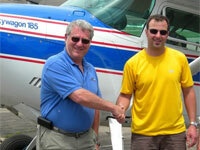 Your team of flight instructors are highly focused on safety and turning out safer, confident and more aware pilots. I look forward to working with AFIT and John again in the future. Thanks. Bill was endlessly patient with me with an absolutely crazy schedule. He knows that basics of instrument flying in and out – as you know. He did a good job meeting my schedule and getting me prepared. Overall, he was super great. He never responded when I got frustrated, and found a new way to teach me when I got stumped. Thanks for coordinating all of this. Working with John has been a pleasure and a great return on my investment. I found John to be consistently thoughtful about how I could most efficiently make progress towards the goal, an excellent coach in the cockpit, and a font of real world piloting experience. All in all, this has exceeded the expectations I had when I signed with AFIT. I’d absolutely recommend AFIT and John as an instructor and would be happy to provide a positive reference any time if it would be of help. 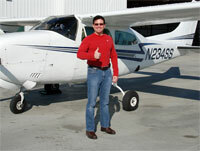 I wanted to take a minute a tell you how excited I am to have completed my IFR training using your finish up program. As you know, I have been working on my IFR ticket for almost 2 years and was ready to just give it up altogether. With my busy schedule and trying to work that around a local CFI with other students it would have been almost impossible to have ever completed my training. During our first talk, we had planned on having Bill come to Mississippi and train here but, after talking with Bill about my schedule we decided that it would be better if I came to Georgetown. What a great decision that was for me. I can’t tell you how much I learned from Bill with his years of experience, knowledge and willingness to teach others, he made the training fun. Being able to go to Georgetown and train away from the day to day business activities was definitely a benefit. The tips and training I received from Bill gave me a better understanding of aviation in general and not only help me pass my check ride but made me a more confident pilot. I never thought that getting a clearance could be so easy. I am so thankful for Bill’s patience and willingness to teach others. See you soon, I look forward to working with Bill in the future to complete my commercial rating. My delay in writing is entirely AFIT’s fault. Since receiving my instrument rating I’ve flown close to 100 hours! 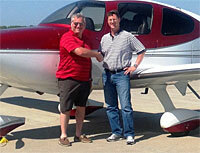 No time to write about how thrilled I am with AFIT… I’m too busy flying our T206H from California to the U.P. of Michigan, to eastern Arkansas and back… twice! After a year of instruction from local CFII’s, I needed to spend uninterrupted quality time with an instructor who only has my success to worry about. Hal showed up and quickly demonstrated his kind, caring expertise. Not only is Hal well qualified with the overall IFR system, regulations and procedures, Hal is also familiar with an incredible variety of aircraft. 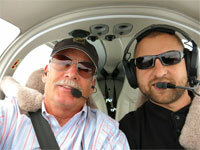 Hal’s familiarity with the 206 and G1000 was impressive and comforting to me. Hal’s professional flight deck experience in turbine/multi-engine aircraft brought discipline and cockpit procedures to me and my humble 206. On the first day we did an evaluation flight. This flight allowed Hal to get to know me as a pilot, and for me to get to know Hal as an instructor. AFIT sent the best instructor for my learning style! After this flight, Hal designed the training for my specific needs so we could cover what was needed to take and pass my check ride. We spent the next days focused on what I needed, practiced the procedures, went over the likely oral questions and scheduled the check ride! Wow… in three days I was ready! Hal was very professional, very thorough and extremely knowledgeable. I recommend AFIT and Hal to all the pilots I know who are ready to become better, safer pilots. Feel free to contact me if you need additional detail. Thanks again for making my flying dreams come true! As for my experience with Ralph, I can truly say that I had a great time. Don’t get me wrong, I was tired. Much more tired than I thought I would be. 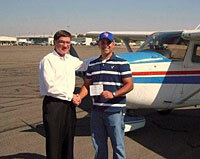 Ralph worked me hard over the five days, and it yielded me an instrument rating in the end. Prior to Ralph, I’d had over 50 hours of training with various instructors. I had all the typical reasons for having so much time and so many instructors. In the end, the finish-up course made the most sense to me. The decision paid off since I’m finally done. Ralph is a great instructor and great guy. Even after all the prior training I had, I still learned things from Ralph that nobody else had ever taught me. I have no reservation recommending him to anyone. Just a quick word to tell you how happy I am with the instruction. Cholena and your flight program have far exceeded my expectations. She is such a talented CFI. Her abilities, attitude and methods have taken me many levels beyond my pre-solo situation and introduced me to a much more effective and safer way to fly. Thanks for all you work and I very much look forward to more AFIT instruction in the future.